People that report these sightings seem sincere but I believe it shows how unreliable our senses of what we are seeing really are. Exactly! Not everyone is lying. However, trying to get "knowers" to accept the fact that they just might be wrong about what they claim to have seen seems to be an exercise in futility. I once "knew" how to do some calculus and now I don't. So it's possible to ya no be a knower, no? Another factor to consider when it comes to cryptid sightings is out of the way pranks and other forms of guerilla art. I don't know, I had a relative that was unfamiliar with beavers and thought they had spotted a cryptid. I just think people are unfamiliar with the native wild life because they never spend anytime outdoors. 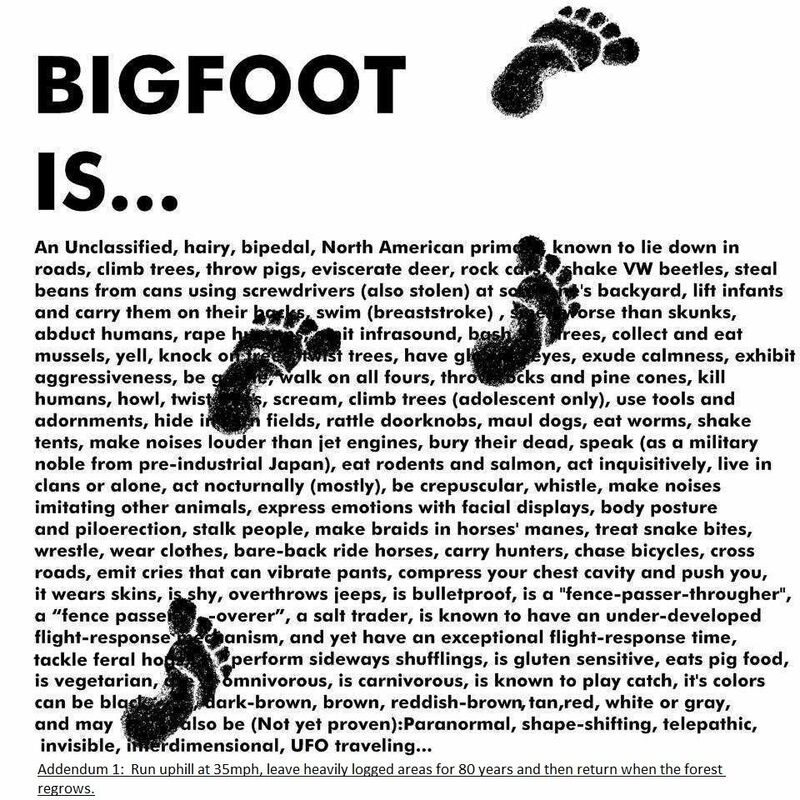 Some Bigfooters argue that either the Bigfoot phenomena is caused by real Bigfoot, or there is a vast conspiracy to make it look that way. And, of coarse, they say the conspiracy theory is a more outrageous idea than the existence of Bigfoot itself. You point out an important, probable cause for some of the phenomena -- the out of the way prank. This does not require a conspiracy of hoaxers. Instead, one thread of Bigfoot "evidence" is manufactured by an individual on a lark or a fun side trip intentionally sowing wonder and surprise. For instance, Bigfoot tracks have been found in out of the way places where a hoaxer would seem to be wasting his time hoaxing tracks. What if the scenario is played out this way: an outdoorsman, back-country hiker, hunter, etc., brings his giant feet stompers in his backpack, and when he has the time away from his hunting, hiking, etc., and finds terrain suitable for the planting of tracks, he mischiefly lays down some Bigfoot tracks. He probably will never know if anyone else will ever find his handiwork, but he nonetheless chuckles to himself imagining how surprised some other hunter or hiker would be to discover them. This type of prank is a possible explanation for cryptid artifacts like Bigfoot tracks. I'm not sure how it would relate to sightings, unless an artificial cryptid was left out some place to be glimpsed. Tell y'all what... 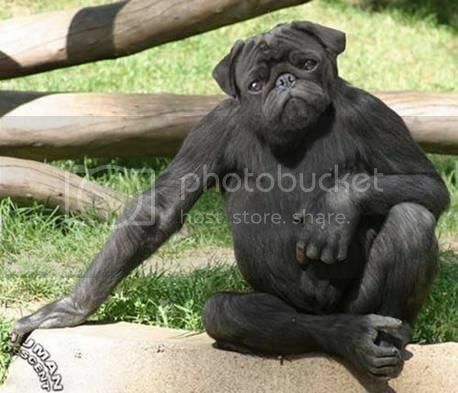 I seen that there dogman the other day. Dang thing started talking to about politics and religion, I had to leave before being rude. That's either a Pimp or a Chug. @jerrywayne: yes, you described how a lot of hoaxers operate. 'Footers think it more likely that a population of giant apemen is out there than that a population of adolescent humans is out there. Apparently, no footer has ever set foot in a frat house.
. He probably will never know if anyone else will ever find his handiwork, but he nonetheless chuckles to himself imagining how surprised some other hunter or hiker would be to discover them. Though I've been known to pull a few pranks in my day, it seems to me that the most likely scenario for both of the above is that the prankster/hoaxters are the reporters themselves. Field Researchers ARE Finding Bigfoot -- Really? There is a curious new trend developing in the world of Bigfoot. More and more Bigfoot believers are taking to the field and are actually seeing the beast that is the object of their quest. Unlike the last several decades when Bigfooters would come up empty in the field, where they were chasing sighting reports and told where to find previously discovered tracks, today’s field researchers are, well, Finding Bigfoot. These feats are primarily and strangely grouped in Texas and Oklahoma, areas not known to be home to indigenous unclassified giant apes or giant aborigines. Let’s look at the North American Wood Ape Conservancy (NAWAC). Alton Higgins is a member of the board of directors of NAWAC, a biology professor, and a wildlife biologist. While investigating a sighting in a sparsely wooded area of Oklahoma, he had his own sighting. His Bigfoot was black and as massive as an angus bull. It moved quickly, oddly in a bent over posture. A year later Coyler had another sighting at “Area X.” His sighting can be found around the 43:40 mark. Other members have sighted various Bigfoot at the location as well. Continue with the video to hear these sightings, and hear from a member that was actually touched by a wood ape (while he was sleeping). It is interesting that before his Oklahoma sightings, Coyler saw a wood ape in Texas too. He and his wife were taking a short walk near the Trinity River when he saw it. The Mid-America Bigfoot Research Center (MABRC) also has had success in locating Bigfoot. Here, researcher Randy Harrington recounts his brush with Bigfoot near Honobia, Oklahoma (not far from Area X, btw.) He has video of the Bigfoot: The Honobia Ridge Walker. The next video also by MABRC shows an investigation by the Green County Bigfoot Research Center where their computer camera is picked up and moved around by something. The most interesting part is their claim they also had sightings of Bigfoot moving on all fours. The MABRC, btw, says it has a photo of a young Bigfoot walking in such a manner, but I’ve been unable to find it posted for non-members. Now we move to the Searching For Bigfoot group as they explore a swampy end of a lake near Paris, Texas. Tom Biscardi and company find what they are looking for. Troy Hudson is a former member of BFRO. He has come to understand Bigfoot as Okla Chito, the Big People. He has even spoken to them. These reports are just a sampling of the Bigfoot Researcher Phenomena of Finding Bigfoot. Clearly a type specimen is nigh. That or people are making **** up. The only beast, is in their mind. They most likely either saw a bear or made the entire story up. Who cares? No bigfoot is still no bigfoot. People claim to see all sorts of things in this world... when you start giving any of them credence with no viable evidence, then you are the fool just as much as them. 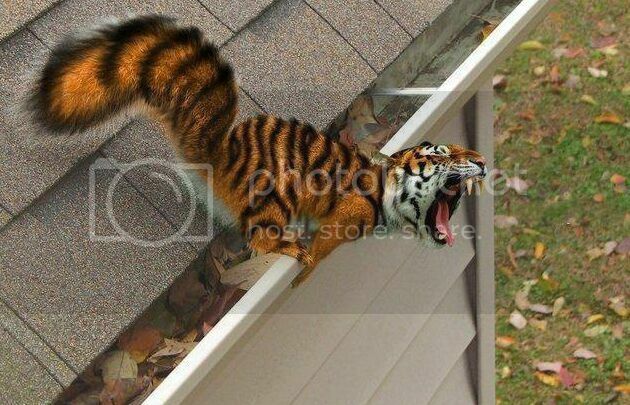 I saw this terrifying squirrel the other day on my roof. Dang thing was ferocious. I nearly lost a finger. Here is a picture of my "sighting". We need to do a scientific study on ferocious squirrels. Oh you havent seen one? Too bad! They only pick special people to see them. Only if you are unarmed, and do not have a camera. I got this picture from a specially made trail camera that was hidden with the scent of used womens hygiene products. You should contact Loren Coleman about the squirrel. Maybe it will be in the next edition of "Mysterious America." I'm of the mind that mistaken sightings need not be explained by appealing to a similar looking creature. You think Brown and Strain may have seen bears. Possible, given the blackness of the animals and the fact bears are local natives. But, they claimed the animals were too fast ascending the hill for bears. I'm thinking they may have seen something totally different than what they think they saw. Consider that Brian originally claimed he saw two smallish black objects that appeared to glide up the hill. He admitted that he would not have thought of an ape had he had the sighting under a different context. He became convinced that he saw apes because others there, who really had no appreciative better viewpoint, all claimed they saw Bigfoot. So it's a known fact that apes can run uphill significantly and obviously faster than the 35 mph or so often attributed to bears? How close-minded can you be? Can't know what it does or does not(*). (*) Unless, of course, when it is convenient for the belief. Where's that list compiled by Drew of what bigfoots do? Where are the mid-tarsal breaks, the hypersensitivity to electronic devices, the human DNA, the affinity to gigantopithecus genus, etc.? When one of these folks plugs a bear out of season, I'll bet that becomes a bigfoot as well. The body will mysteriously disappear save for a "steak" that will be stored in a Mason jar under Funk and Wagnall's porch where again mysteriously, it will be stolen. Or swapped for a bear steak. Georgia sometimes have reports of a unusually large canine like animal living in the south ga swamps and in northern florida. Some people claim its a remnant dire wolf population. In my opinion its probably just a bear which in south ga is slimmer and more dog like than other bears. Help me out. What's one of these? People who report "Dire Wolves" I think are picturing something much larger than a Gray Wolf, but that really isn't the case. I'd call "dog bears" as good a hypothesis as any. Bears are very slender in the spring, when coming out of hibernation. Kinda wierd looking, compared to how we're used to seeing them. IIRC, they were large wolves arond during the Pleistocene. See the wiki at http://en.wikipedia.org/wiki/Dire_wolf. Edit: The Shrike beat me to it. Last edited by rockinkt; 17th June 2013 at 06:36 AM. Oh! I thought it was a D&D monster. The bear equivalent of heroin chic. Would or could a Dire Wolf swallow or chew up Bigfoot remains until nothing is left to identify? Of course direwolves are still around. Plenty of high-quality footage of them available at all three seasons of Game of Thrones. But that's Westeros. In North America, they are kept as pets by bigfoots. Of course, by those bigfoots which are dog people. Those which are cat people, have phantom panters as pets. Well, sure. Think of how bad stinky feet smell. Now imagine those feet are BIG and your sense of smell is 100,000 times more acute. I'd run too. Well, Shrike, you are forgetting that we are dealing with the Clark Kent of the ape-world. "Faster than a speeding bullet......" and all that. Cryptozoologists do tend to romanticize. Any mysterious lake or river sighting becomes a whale or reptile from pre-history. Any unusual canine is converted into a dire wolf; felines become an American Cheetah known from the fossil record. A dog swimming/walking in the shallows in "lake monster" habitat is a "Super Otter." Bigfoot sightings become evidence of relict gigantopithecines. The Rancho La Brea tar pits museum has something like 300 dire wolf (Canis dirus) skulls on one wall. It's one of the few times paleontologist a have been a blue to do population studies, in fact. Beautiful creatures. I wish I could clone one. That's the cool part of REAL science--we get to study monsters made even more awe-inspiring by the fact that they were real. They in fact encountered humans. You want to be really terrified, look up short-faced bears. Closest thing to a demon humans have ever encountered.